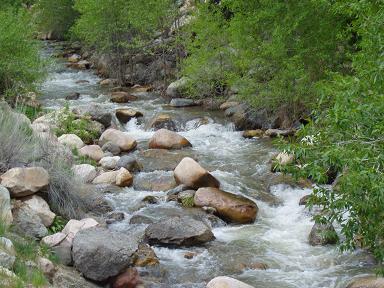 Peteetneet Creek is located up Payson Canyon in South Utah County. The creek is very small, and in fact much of the year it runs completely dry in the lower stretches of the canyon and into Payson City. In the upper canyon, however, near Payson Lakes, the stream is home to a few Brook Trout that have escaped down from the lakes above, as well as some stocked Rainbow Trout that are placed there by the Utah DWR. The stream is heavily stocked with catchable Rainbow Trout during the summer and early fall months. Take I-15 to Payson Main Street (Exit 250). Head south on Payson Main until junction with Hwy. 198 (stop light). Turn left (east) onto Hwy. 198. Turn right (south) onto 600 East (Canyon Road). Head south on Canyon road up into Payson Canyon. The road follows the creek. Since the creek is dry for much of the year in its lower stretches, angler should concentrate their efforts on the upper half of the stream, where water flows year round. Small flies such as hare's ears, pheasant tails, and other nymphs should work well, but the most common method here is with bait such as small worms or pieces of nightcrawlers fished in the holes behind rocks. If you can find a good pool or a large enough hole, tossing	a 1/16 oz. spinner and reeling it back downstream with the current may result in some fish as well.